Chi Mei electronics showed off 22″ LED backlit LCD monitors at Computex 2007. These monitors are expected to be shipped in third quarter of 2007 and are expected to cost more than 50% when compared to their conventional counterparts. Screen sizes from 19″ to 22″. Resolutions upto 1680 x 1050 pixels. Viewing angle upto 170/160 degrees. What is LED Backlit LCD monitor? 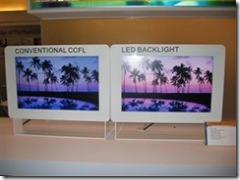 LED backlit LCD monitors use LED’s to illuminate LCD panel instead of cold cathode fluorescent lamp (CCFL). To know more about LCD panels or monitors go here. Colour saturation upto 110% can be achieved. Lower power consumption since LED consumes less power when compared to cold cathode fluorescent lamp (CCFL). The electronics used are lighter in weight so LED backlit LCD monitors are lighter when compared to CCFL LCD monitors. LED backlit LCD monitors will be soon replacing the conventional cold cathode fluorescent lamp based LCD monitors in coming future. Even though these monitors would be priced higher initially but they are worth for the advantages that they offer over cold cathode fluorescent lamp (CCFL) based monitors; once these become mainstream the price would automatically come down.